After graduating and working with a New York based fashion house for five years, he launched H2O a brand of mens' shirts and ties for the domestic market. 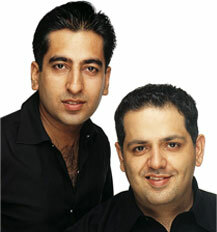 After the success of H2O, he teamed up with designer Rahul Khanna and launched 'CUE'. After completing a course in Apparel Merchandising at NIFT, he worked as a freelance designer and stylist for various leading export and fashion houses in New Delhi and Mumbai, in 1998 joined designer Rohit Gandhi and launched 'CUE'. Their collections are based on Straight Line clothing, retaining the very basic elements of style & quality, and keeping in mind the increasing demand for western wear in India, which has been ignored in the past. They keep their silhouettes sharp and defined with an emphasis on fabrics, cuts and a lot of detailing rather than on embellishments. The look this year is understated chic.